At the end of a tiring search for trains and ticket, I left home at around 2030. Getting a bus from my home to the nearest town is another challenge, in itself, especially if the time is past 2000. A bus turned up after about 7 minutes of anxious wait. The bus short-terminated before the scheduled bus terminus – as luck favours, the bus stopped right near the place where I would get my onward connection. The wait for the onward connection was even longer – about 20 minutes. A private bus heading to Parur turned up – a passenger waiting at the bus stop asked if buses to Ernakulam would be turning up anytime soon. I replied in positive. 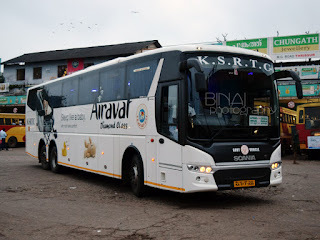 A couple of home-returning KSRTC buses passed by, as my wait progressed. Two buses heading to Ernakulam turned up one behind the other at 2100. The first guy stopped, while the second went without stopping. The bus had just about 10 passengers. 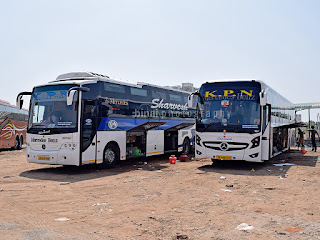 Both the buses – my bus, RT177 of Thrissur depot, and the other, RT87 of Ponnani Depot – made it a point to compete with each other all along the journey. The bus dropped me near Ernakulam Town Railway Station at about 2205. Had a nightwalk from the bus stop to the railway station. Quickly joined the queue at the ticket counter, and asked for a sleeper class ticket to Mangalore – the counter clerk said that was not possible, and issued a second class ticket. Armed with the ticket power, I headed straight to the platform. Just around this time, WDM3A #14140 of Ernakulam arrived on the main line from Idappalli side with an empty 4-wheeled tanker rake. I desperately wanted to click an image of the loco, but a couple of RPF guys decided to admire the loco at the very moment. I chucked the idea of every pulling out my camera, and headed off in the direction of the starter. Being at the middle of the week meant that the platform was sparsely crowded, much to my happiness. A while later, WDM3A #14081 of Ernakulam pulled into the station with the Trichy bound Tea Garden Express. The only little crowd on the platform went by this train. A little later, Arakkonam WAP4 #22768 arrived on the other platform with the Chennai Egmore Express. This train takes over 24 hours to reach its destination, taking a circuitous route via Alappuzha, Thiruvananthapuram, and Madurai. A train via the shortest route would reach Chennai in less than 12 hours. The train was heavily crowded, and appeared pretty popular among passengers heading to the capital city (Thiruvananthapuram) and beyond to places in Southern Tamil Nadu. Erode WAP4 #22256 rushed through the main line, towards Idappalli, with the Mangalore-bound Maveli Express in tow – at around 2330. The boards “Thiruvananthapuram <-> Mangalore” on the train worried some passengers waiting for the Malabar express – many were unaware of the existence of Maveli Express. Not much after Maveli went through; an announcement was made about the arrival of Malabar. A headlamp was visible not far away by now – surprisingly, from both sides. Erode WAP4 #22729 crawled through the main line with the Bilaspur-Tirunelveli holiday special, while Erode WAP4 #22665 arrived on the platform line with the Mangalore bound Malabar express. As soon as the train stopped, the TTE had a busy time – giving out seats in upper classes. I asked for a seat in either of the AC coaches, which was turned down due to non-availability. I asked for First Class – the TTE gave out a surprised look, and said I could take coupe G! The train started from Ernakulam at 2349, delayed by about 4 minutes. Soon after the train started, the TTE came around and collected the fare difference. A receipt was issued, and my name was entered on the reservation chart. The 26-seater coach had about 16 passengers and two RPF guards. My coach – F1 – was built in 1989 – just three years younger to me. The coach was classified as “WFC”, and was numbered “89876/G”. There was a marking inside my cabin, which said “6 by day 4 by night”. The cabin was dusty and seemed not cleaned for ages. The attendant came around and offered a bed roll – for Rs. 20. We were rushing through Kalamassery by now. The coach had four fans, two lights and one night-lamp. We made our first halt at Aluva – at 0005, early by 7 minutes. The RPF Patrol in my coach were walking around the coach on the platform. I locked up my cabin, and prepared for a nice sleep. We left Aluva, perfectly on time, at 0015. While I struggled to get some sleep, the train made stops at Angamali (0024/0027), Chalakudi (0041/0044), Irinjalakkuda (0054/0057) and Thrissur (0118/0125). I woke up just as the train was entering Kannur station. We arrived at Kannur, early by 5 minutes, at 0630. I got off from my coach and headed to check out my loco. The loco working my train was Golden Rock WDM2 #16884. On the adjoining platform, WDM2 #16880 of Golden Rock was waiting with a Mangalore bound passenger train. After a couple of snaps of both the locos, I headed back to my coach. On the way, picked up a cup of tea. Just as I finished tea, I purchased a pack of Idli-sambar for breakfast. The clock ticked past 0640, but there were no signs of my train moving. The PA system now announced that the Trivandrum bound Parasuram express was arriving on Platform 3. We waited till Parasuram came in, and finally left Kannur at 0656, delayed by a whole 16 minutes. Malabar runs more or less as a Passenger train after Kannur. It stops at almost all stations enroute, barring halt stations. Doubling works in the Kannur-Valapattanam section is currently at a standstill. There appears to be some kind of a land stability issue in this section, which is preventing the railways from commissioning the newly laid tracks. Due to these issues, the section is turning out to be a bottleneck, and is preventing addition of more trains. We had a halt at Valapattanam, and then continued the run. The journey ahead was eventless, and there is not much to state about. It rained slightly on the way, and I had to pull down the glass shutters for a while. There were plenty of First Class Pass holders on this route, and they made sure each cabin was packed to the brim. 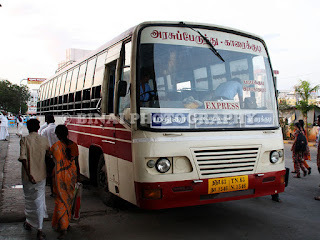 The TTE on his part ensured that all who boarded FC coach had a valid ticket or a pass. The train continued its “stop where you request” run, making a halt every 7 kilometres on an average. The next major halt was Payyanur (not counting the 4 other stops between Kannur and Payyanur). A good crowd alighted, and a better crowd got in. We left Payyanur at 0740, delayed by 15 minutes. The gangway... to the left are passenger cabins..
We crossed the Mangalore-Chennai Egmore express right outside the station. After Payyanur, we stopped at Trikarippur, Cheruvathur, Nileshwar, Kanhangad, Bekal Fort, Kotikulam… Huh! And so on, till we reached Ullal. Ullal was the last halt before our destination. I was expecting my train to halt at Netravati Bridge as well, but that did not happen. We crawled through the bridge and slowly curved towards Mangalore Central station. This was my first day light journey to Mangalore Central station – my earlier sojourns were at night. Before closing, I thoroughly experienced the First Class ride – the legacy of that class is unmatched by any other class on the Indian Railways. My earlier experience on “First” was on Air-conditioned First Class – that is an experience in itself, and one needs to experience it. A journey on the conventional First Class coach is a must for any railfan. There aren’t many First Class coaches around. The only little are nearing the end of their life spans. The privacy offered by a coach that has cabins for passengers is unmatched, and is worth every penny you pay. While it is sad to see a legacy getting closer to extinction, it makes commercial sense to the railways to carry more passengers per coach, than just 26 passengers. The year 2009 has been kind on me till date, with many firsts happening. There are some more firsts waiting to happen – hopefully they are accomplished by the end of this year! I had a lot of questions for you, but since I couldn't catch you in Bangalore, will post some of them here. Doubling works in the Kannur-Valapattanam section is currently at a standstill. There appears to be some kind of a land stability issue in this section, which is preventing the railways from commissioning the newly laid tracks. I presume then, that the second line has already been laid, but is awaiting commissioning? What about the bridge across the V. River, which was pending for a long time? Also, do the two lines run on distant alignments or adjacent to each other (didn't quite understand the land stability problem)? There were plenty of First Class Pass holders on this route, and they made sure each cabin was packed to the brim. Wonder what they would do once the FC coach is scrapped. Are they permitted to travel on 3A? The train continued its “stop where you request” run, making a halt every 7 kilometres on an average. I guess this is due to the lack of passenger trains on this section - only 3 each way, at last check. After Payyanur, we stopped at Trikarippur, Cheruvathur, Nileshwar, Kanhangad, Bekal Fort, Kotikulam… Huh! And so on, till we reached Ullal. Any views of the sea at any of the above places, apart from Bekal Fort? We crawled through the bridge and slowly curved towards Mangalore Central station. What is the status of the Netravati bridge doubling? Where does the double track end at present? I spotted a Krishnarajapuram loco shunting an unknown train at a distance. Presumably the loco of 6517 - after the introduction of 6515/16, I think the link is probably now shared thrice a week. A journey on the conventional First Class coach is a must for any railfan. The bridge across Valapattanam River was completed atleast three years back. There were NO bridges pending on the route, barring the Netravati River Bridge. FC pass holders are permitted on 3A/CC wherever available. They need to pay SFSC if application. They can also make a reservation by paying only there reservation charges (for which a "Reservation Slip" would be issued). Malabar was always a "passenger" train. A new passenger train is not being introduced, perhaps, due to the presence of Malabar. BTW, there is a passenger train running right behind Malabar. The Sea is visible "clearly" only around Bekal Fort. Otherwise, the sea would be visible while on bridges. Netravati Bridge - about 25% Girders are ready, the same number of pillars are awaiting launch of Girders. About 50% of the length is yet to be worked upon (Basic piling and foundation works are complete though). The KJM loco was indeed the power of 6517. The Land stability issue in the CAN-VAPM section arose while re-grading was in progress. The new line is parallel to the old line. Double line was commissioned in the section, but was open only for a very brief period (This was in 2005, IIRC). The old line was decommissioned for line re-grading. However, things went wrong, and embankments were washed off during the subsequent monsoons. This led to certain land stability studies, and it turned out that the sub-soil was unstable. This trouble was detected in the CAN-Chirakkal Halt section. Beyond Chirakkal Halt, upto VAPM, double line exists but is not being used. Malabar definitely runs as a "passenger" train between CAN-MAQ and QLN-TVC...pls cud u post the link for the First AC travelogue?